a quilt to member Owen Wasmoen which was a long time in the making. This quilt had its beginnings in a bag of Dresden plate circles found in the Comforter’s quilting closet about 3 years ago. They knew they were old, but didn’t know where they came from. People often leave bags of fabrics, unfinished quilts, unneeded sheets, etc. in the closet that the Comforters use for making Lutheran World Relief quilts. Jeanette Beamer took them home with the intention of doing something with them for our annual quilt auction. It didn’t get done. Leslie Leeper saw them and said she would wash them and replace torn fabric pieces if Jeanette would show her how to machine applique them onto a background. That was done one summer after some sashing and some backing for it was found. Another year went by. This past November, the quilt top still was not completed. During the auction, Owen Wasmoen approached Jeannette asking if there was a quilt that would fit his queen size bed. Jeannette showed him the Dresden plate quilt. He liked it and with another border added, knew it would fit. 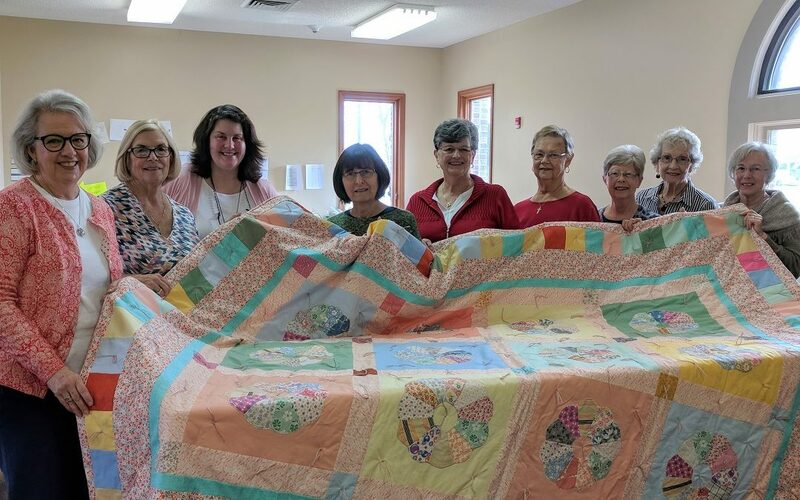 The Comforter ladies worked together to finish the quilt this winter. When Janet Smith saw the quilt top a few weeks ago she recognized the Dresden Plates as the ones she had brought in years ago. They came from either Lee Smith’s grandmother or aunt. Now these beautiful antique blocks finally are at home with the Wasmoen family. The Messiah Comforters Group meet on Tuesday mornings from 9 a.m. to Noon (sometimes later) throughout the year. The group is led by MLC Member Annette Joens. Newcomers are always welcome. No advanced sewing or quilting experience required.